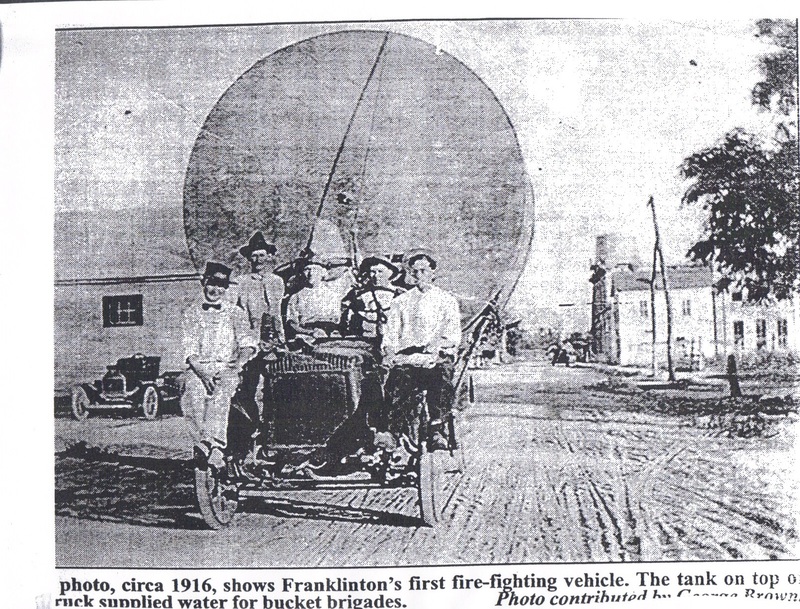 Before 1921 fire fighting was done mostly by bucket brigade. In 1926, civic leader Paul E. Greenlaw made the first effort to organize a fire department. Cubic C. Simmons was the first fire chief and Dr. T.C.W. Magee was the secretary. Mr. Greenlaw donated a truck to haul the equipment. Enough town support was gained to erect five or six small houses in the business section. These houses were used to store the two wheel carts of fire hose. Others included in this early group of fire fighters were: Fred Bateman, Odgen Doremus and Vic McKenzie. 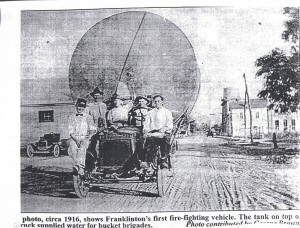 In approximately 1933, a disastrous fire almost destroyed the business section of Franklinton. The fire department of Bogalusa saved the town. In 1934, throughout the efforts of Mr. Paul E. Greenlaw, our modern fire department was organized. A tax of 5 mills (two for the fire department and three for water works) was passed in 1934. George Varnado was appointed Fire Chief. Mr. Varnado and Mr. Bryan Fussell went to Logansport, Indiana to accept delivery of the fire truck. The original ford truck is still in use. At the time of the purchase Mr. L.O. Torregrossa was mayor and Mr. C.J. Gayer, P.N. Givens, Geo. Brown, W.E. Magee, and Robert W. Bateman were council members. Mr. Bateman and Mr. Magee still reside in Franklinton and Mr. Givens in Bogalusa. In 1947 a second truck, a Chevrolet, was purchased. This truck, though badly worn, is still in use. In 1950 a fire station and city hall was completed. A full time paid employee is on duty at the fire station at all times. Since 1950, a 960 gallon water truck with portable pump has been purchased. These can be used for fighting rural fires. Through the efforts of George Brown, a son of the city councilman, an American LaFrance truck was purchased. Today the fire department has four Engines, one Ladder truck, one Rescue truck, one brush rig, one Tanker, and one Utility Truck. The department is composed of a chief, three assistant chiefs, a secretary and a treasurer, and twenty other members.